Breast cancer examination delays is a condition where breast cancer patients come to know their condition exceeds the specified time (cancer stage III) when cancer can not differentiate well to get treatment. In Indonesia, almost 70% of breast cancer patients are too late to do examination. Data at Arifin Achmad Regional Public Hospital show increasing number of breast cancer cases, where in 2012 there were 145 cases, in 2013 there were 262 cases and in 2014 there were 584 cases. This research aims to know the factors that related to breast cancer examination delays such as knowledge, education, income, pain, fear, family support, BSE (breast elf examination), distance to health service, resources and family history of breast cancer. The research type is quantitative analytic observational. The research design is analytic cross sectional study. The populations are outpatients women with breast cancer who came to Arifin Achmad regional public hospital Riau Province and total sampel are 203 women. The data were analyzes by univariat, bivariat analyzes by chi square and multivariat analyzes by multiple logistic regression. The results of this research show that knowledge effect 3 times, income effect 3 times, distance to health service effect 2,5 times and pain effect 2 times to breast cancer examination delays. The conclusions of this study are there are casual link between knowledge, income, distance to health service and pain to breast cancer examination delays. 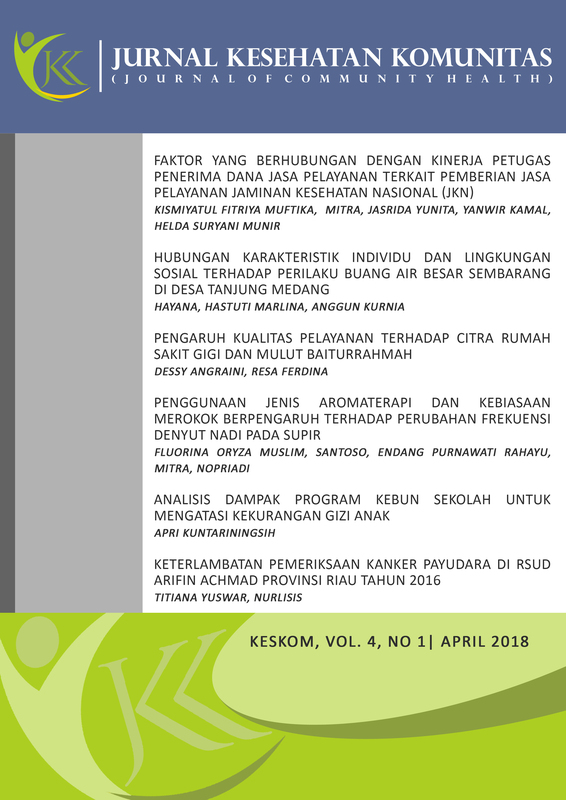 Recommended to women to improve their knowledge about breast cancer examination and suggested to Health Departement of Riau Province through community health centers to give education and socialization about breast cancer to community.